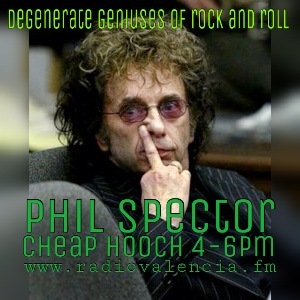 Cheap Hooch Presents: Degenerate Geniuses of RnR-Phil Spector Day!!! We finally did!! Join us on our fifth installment of DGoRnR Phil Spector Day! This week we profiled the prolific and demented Phil Spector. Listen in as we talk about his rise to fame and descent into infamy. Both his personal life and musical career are reviewed on this show.